The Senate will reconvene at 2 pm today and resume consideration of Porkubus - the 2,900 paged H.R. 1105, 2009 omnibus appropriations bill. 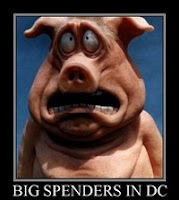 The $410 billion bill combines the 9 unpassed appropriations bills from last year and funds the federal government through September and adds more than $7.7 billion in pork projects. -- $200,000 for a "tattoo-removal violence-outreach program" in Los Angeles. -- $1.9 million for a water taxi service in Connecticut (called the taxi to nowhere). -- $473,000 for National Council of La Raza (La Raza has supported radical Mexican nationalism within our borders). -- On on it goes (and soon may be released on the American taxpayers). Just as bad, the bill does not require competitive bids -- which will lead to corruption and insider deals for our tax dollars! Well-connected friends of members of Congress and the lobbyists will get the contracts without even having to compete for them! A continuing resolution passed Friday expires on Wednesday. At 5:30 pm, a series of votes on amendments is expected to begin. There is still time to call your Senators and to tell them to Senate now and say "Purge The Pork"
On Thursday, Democrats were unable to get 60 votes to cut off debate and amendments to the omnibus bill, so work on the bill continues today. Thirteen amendments remain to be considered. Among these are amendments from Sen. John Ensign (R-NV) to remove a provision designed to kill the D.C. school voucher program, from Sen. David Vitter (R-LA) to do away with automatic congressional pay increases, from Sen. John McCain to require earmarks appear in the text of bills, and one from Sen. John Thune (R-SD) concerning the fairness doctrine. Freedom Alert: tomorrow, Sen. Ted Kennedy (D-MA) is expected to hold a hearing on the card check bill in the Senate Health, Education, Labor, and Pensions Committee. This is the bill to take away the secret voting rights of employees to decide if they wish to have a union. It appears that the more pundits, publications, and members of Congress examine the spending plans coming from Democrat leaders in Congress and the administration, the more they’re uncomfortable with them. Democrats at both ends of Pennsylvania Avenue are asking Americans and their representatives in Congress to approve of unprecedented increases in spending, in borrowing, and in taxes. Hopefully more Democrats will show more skepticism of these plans in the next few weeks. The important question, of course, is whether enough Democrats will be skeptical enough to make a difference. Tags: Card Check, Congressional Pork, federal spending, omnibus bill, porkubus, US Congress, US Senate, Washington D.C. To share or post to your site, click on "Post Link". Please mention / link to the ARRA News Service. Thanks!